Celebrating the life of Merle Franklin Stewart, Sr.
Obituary for Merle Franklin Stewart, Sr. Brother Merle F. Stewart, Sr was born October 19, 1953 in Brooksville, FL to the late Rev. David and Blanchie Stewart, Sr. In his life he attended and graduated from Hernando High School (1971). He furthered his education by attending Eckerd College then transferring to United College where he graduated with his Associate's degree in Computer Science. Merle moved to Tampa, FL where he was united in marriage to Nadine Nichols, November 15, 1975. He was employed with National Health Laboratory as a Lab Supervisor for 10 years. He later became employed with West Coast Truss as a Truss builder where he stayed for 18 years. He was also the cook for BBQ King for 10 plus years. In his spare time he loved to fish, cook, listen to music, sing, and dance. Merle became a member of St. James Missionary Baptist Church where he turned his life over to Christ being baptized in 2016 under the Leadership of Rev. David C. Stewart, Jr. Brother Merle F. Stewart was a husband, father and an extra ordinary grandfather. 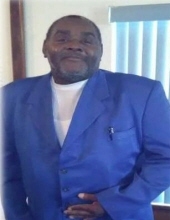 He was preceded in death by his parents, two brothers: Alvin D. Stewart, Sr., and Kevin L. Stewart, Sr., three sisters: Gloria Harris, Carmalita Williams and Sillar Townsend. He leaves to cherish his memories, a wife of 42 years: Nadine Stewart, Children: Shatonna Graham (Clifton), Chiaka Stewart, Merle Stewart (LaQuanta), Merle Barnes (DeMetria), and Andre Barnes. Brother: Rev. David C. Stewart, Jr. (Karla). Five (5) sisters: Brenda Stewart, Lois Hudson (Johnnie), Juanita Strother (Delroy), Carla Stewart, Iris Green. One Aunt (1) Vera Chester. Five (5) Sister-in-laws: Ruby Stewart, Belinda Stewart, Patsy Ross, Martha Kitchen and Louise Duhart. Three (3) Brother-in-laws: Minister Willie Kitchen (Kim), Sammie Kitchen (Pearl), and Charles Jackson. God Mother: Gladys McGill, Twenty-eight 28 grandchildren, Six (6) great-children, Special nieces/daughters- Nikesha Cato and Shajuanna Pate. A host of cherished nieces, nephews, cousins and sorrowing friends. To send flowers or a remembrance gift to the family of Merle Franklin Stewart, Sr., please visit our Tribute Store. "Email Address" would like to share the life celebration of Merle Franklin Stewart, Sr.. Click on the "link" to go to share a favorite memory or leave a condolence message for the family.